When I painted this I was using Windsor Newton Water Miscable oils. Now I found M. Graham oils made with walnut oil instead of linseed oil. Very allergy free for me! Here are some quick links to instruction on this blog, too. Some are from some time back, so you may not have seen them if you are new to my blog. Color Notes - how color is affected by the color next to it. Framing Against Glass .. or not - I still do this and think it is the best solution, especially for Pastelbord. A Happy Medium, Color and Value - how color and value can affect your painting. More on Value - how color affects value. Turning on the Light - especially in still life painting. Review of one of my pastel classes/demos. There are more instruction and info posts scattered around my blog. There are many posts about sketching and the pens and equipment I use. Like this one. 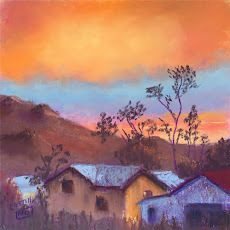 A plein air "how to" is on Art Instruction Blog here http://www.artinstructionblog.com/plein-air-painting-with-pastels-city-of-rocks#more-388 I did this quite a while back but my technique hasn't changed much.